A conveyance of land or of interest in land in Rhode Island is void unless it is made by a deed in writing, is duly signed by the grantor, and acknowledged in accordance with Rhode Island law. The real estate deed must then be delivered and recorded with the clerk in the town or city where the land is located ( 34-11-1). Delivery of the deed is sufficient to create a valid and binding contract between the parties to the instrument, even if it is not acknowledged or recorded. Real property in this state can be acquired, held, and disposed of by any person who is able to enter into a legal contract and can in turn be conveyed to any grantee who has the legal capacity to receive real property or an interest in real property. The authority to convey property in Rhode Island is also extended to aliens. Specifically, aliens may take, hold, transmit, and convey real estate, and may also sue for and recover possession of real estate in the same way and with the same effect as if they were a citizen of the United States ( 34-2-1) . Real property can also be conveyed by husband and wife or any two or more persons to themselves as co-tenants under any tenancy that is legally allowable between them ( 34-11-3). The statutory forms provided in 34-11-12 are used to facilitate a conveyance of real property or interest in real property in this state. The most common of these forms are the warranty deed and quitclaim deed, both of which may be altered according to the circumstances of the transaction. The authorization of the forms by statute does not prohibit the use of other forms. The grantor to a real estate deed in Rhode Island is required to sign the deed and have his signature acknowledged by a notary public, whose signature must also be present. 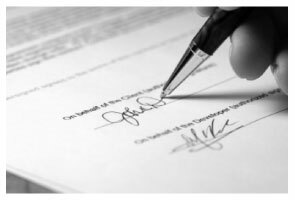 Corresponding names should be typed or printed beneath the signatures of the notary public and other persons signing the real estate deed (34-11-1.1). An acknowledgment is not required to be in any set form, but it should be made by all parties executing the instrument. The certificate of acknowledgment accompanying the document should state that the parties were known to the officer taking acknowledgments and were known to be the parties executing the instrument. If an instrument is acknowledged in a state other than Rhode Island, the acknowledgement must be in accordance with the laws of the state in which the act took place. A city or town clerk in Rhode Island may reject a deed presented for recordation for a variety of reasons, such as not including the required addresses or not including a recitation of the sale price. If a real estate conveyance in Rhode Island is delivered to the grantee, it will be valid and binding as between the parties and their heirs, and as against those taking by gift or devise, or those having notice of the instrument even though it has not been acknowledged or recorded ( 34-11-1). Delivery of a valid real estate deed from the grantor will be sufficient to convey to the grantee all the possession, title, estate, interest, claim, demand, or right of entry or action of the grantor, absolutely, in and to the land conveyed , unless the deed is otherwise limited. Only upon having the deed duly acknowledged and recorded in the town or city where the property is located will the deed be operative to give constructive notice as to third parties ( 34-11-4). Although Rhode Island is divided into counties, it does not have a form of county government. The municipalities in Rhode Island handle the functions of local government, which means that the recording of documents is handled by town and city clerks. Robert W. said: Perfect timing. Everything was consistent and timely. Reply from Staff: Thank you Robert, we appreciate your feedback. A. S. said: First, I am glad that you gave a blank copy, an example copy, and a 'guide'. It made it much easier to do. Overall I was very happy with your products and organization... however, things got pretty confusing and I have a pretty 'serious' law background in Real Estate and Civil law. With that said, I spent about 10+ hours getting my work done, using the Deed of Trust and Promissory note from you and there were a few problems: First, it would be FANTASTIC if you actually aligned your guide to actually match the Deed or Promissory Note. What I mean is that if the Deed says 'section (E)' then your guide shouldn't be 'randomly' numbered as 1,2,3, for advice/instructions, but should EXACTLY match 'section (E)'. Some places you have to 'hunt' for what you are looking for, and if you did it based on my suggestion, you wouldn't need to 'hunt' and it would avoid confusion. 2nd: This one really 'hurt'... you had something called the 'Deed of Trust Master Form' yet you had basically no information on what it was or how to use it. The only information you had was a small section at the top of the 'Short Form Deed of Trust Guide'. Holy Cow, was that 'section' super confusing. I still don't know if I did it correctly, but your guide says only put a return address on it and leave the rest of the 16 or so page Deed of Trust beneath it blank... and then include your 'Deed of Trust' (I had to assume the short form deed that I had just created) as part of it. I had to assume that I had to print off the entire 17 page or so title page and blank deed. I also had to assume that the promissory note was supposed to be EXHIBIT A or B on the Short Form Deed. It would be great if someone would take a serious look at that short section in your 'Short Form Deed of Trust Guide' and realize that those of us using your products are seriously turning this into a county clerk to file and that most of us, probably already have a property that has an existing Deed... or at least can find one in the county records if necessary... and make sure that you make a distinction between the Deed for the property that already exists, versus the Deed of Trust and Promissory note that we are trying to file. Thanks. Reply from Staff: Thank you for your feedback. We'll have staff review the document for clarity. Have a great day! Diana A. said: My service today was outstanding.your rep asked me several questions and was able to get me all the information I needed. Spencer A. said: Deeds.com made it so easy to file my paper work with the county. It saved me half a days travel and cost me about a tank of gas. This service was well worth the saved travel time and energy. I would highly recommend this service to other individuals. The other companies I spoke with only service law firms, title companies & banks etc. Thanks deed.com, I'll be back and will refer all my friends too. Reply from Staff: Thank you so much Spencer, we really appreciate your feedback!